Risking lives to save lives is what firefighters do but LAFD Air Operations Pilots David Nordquist and Joel Smith took it to new heights at the Woolsey Fire on Friday, November 9, 2018. The approach to the rescue begins at the mark 3:29 of the video. Video footage by LAFD's David Nordquist via Youtube. While actively conducting a water drop on a flank of the massive blaze, the pilots of Fire 4 received a request for a follow-on mission to conduct a rescue at nearby Castro Peak in the hills above Malibu. The smoke column thickened and darkened with danger as Nordquist and Smith approached their target. The ridge atop the narrow peak was filled with service buildings, vehicles and antennae, creating an incredibly complex scenario for landing; yet they knew people’s lives depended on them finding a way. With their fuel supply dwindling and no resources available for a hoist operation, they made their approach. 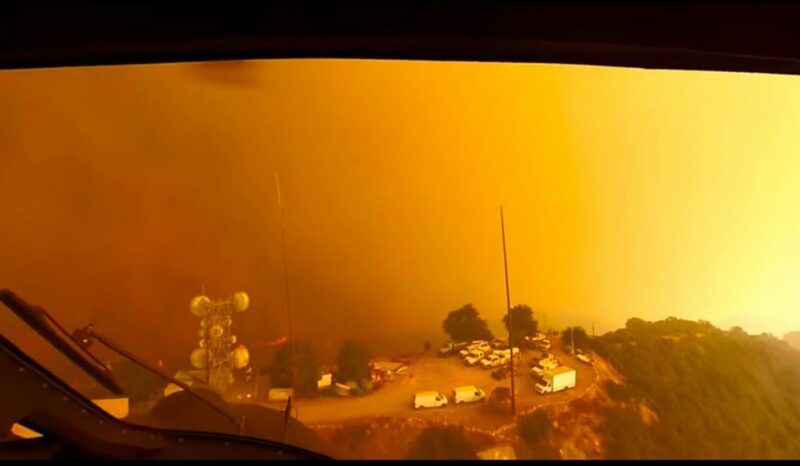 Once on the ground, Nordquist held the idling helicopter amid the brush as the full force of the Woolsey fire bore down on the mountain outpost. Smith quickly exited the helicopter and ran to the aid of the civilians trapped on the mountain. Over the next few minutes, Pilot Nordquist and Pilot Smith fully exemplified the Core Values of the Los Angeles Fire Department; Service, Professionalism, Integrity, Respect, Innovation and Trust. Their professionalism, technical expertise and complete dedication to their mission was directly responsible for saving the lives of three people and two dogs.